No models will be dispatched until funds are cleared. CC04204G SPECIAL GOLD EDITION - ASTON MARTIN DB5 diecast model road car, from the 007 JAMES BOND film GOLDFINGER, driver figure, working ejector seat, front mounted machine guns and bullet proof screen. Re-issue of the 1965 iconic design, Limited Edition. 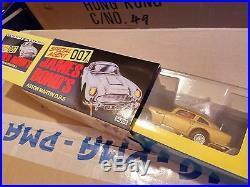 In 1965 Corgi won the first Toy of the Year for the Goldfinger James Bond Aston Martin DB5. Now, in 2015 Corgi present a new release, fully featured DB5 for a new generation of James Bond fans. Usually presented in the iconic silver livery of the film, a very limited number will be produced in a gold finish. Displayed in a special retro-styled anniversary box, the new model will come complete with many features such as James Bond driver, an ejector seat, retractable machine guns and a rotating number plate. Features include: driver figure, Working ejector seat, Front-mounted machine guns, Bullet-proof screen. Non mainland UK parcel destinations such as Northern Island, Scottish Islands & Highlands, Isle of Man, Isle of Wight, Channel Islands etc, etc will be quoted separately and we will send a revised invoice after the order is placed. For large parcels over 2kg to most European countries we now use a courier - this means a far quicker, trackable service, parcels are signed for and better still a much lower cost for you the customer. The above European courier service is for parcels over 2kg and the cost per parcel will be the same up to 30kg maximum, i. Tel: 0115 9313075 Mobile: 07974 419805. In excess of 12,320 diecast models are shown on our web site - see swapmeetmodels co uk. 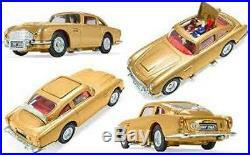 The item "CORGI CC04204G Aston Martin DB5 diecast model road car GOLD 007 BOND GOLDFINGER" is in sale since Monday, July 6, 2015. This item is in the category "Toys & Games\Diecast & Vehicles\Cars, Trucks & Vans\Contemporary Manufacture". 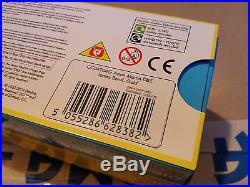 The seller is "swapmeet-models" and is located in NOTTINGHAM, Nottinghamshire. This item can be shipped to United Kingdom, Austria, Belgium, Bulgaria, Croatia, Cyprus, Czech republic, Denmark, Finland, France, Germany, Greece, Hungary, Ireland, Italy, Lithuania, Luxembourg, Malta, Netherlands, Poland, Portugal, Romania, Slovakia, Slovenia, Spain, Sweden, Australia, United States, Canada, Japan, New Zealand, China, Israel, Hong Kong, Norway, Indonesia, Malaysia, Mexico, Singapore, South Korea, Switzerland, Taiwan, Thailand, Estonia, Latvia, Brazil, Chile.